In light of the Nepali earthquake, I researched the best way to survive and earthquake and shared some quick useful tips from my research. I hope this is helpful to you. Please share it with your friends to keep them safe! 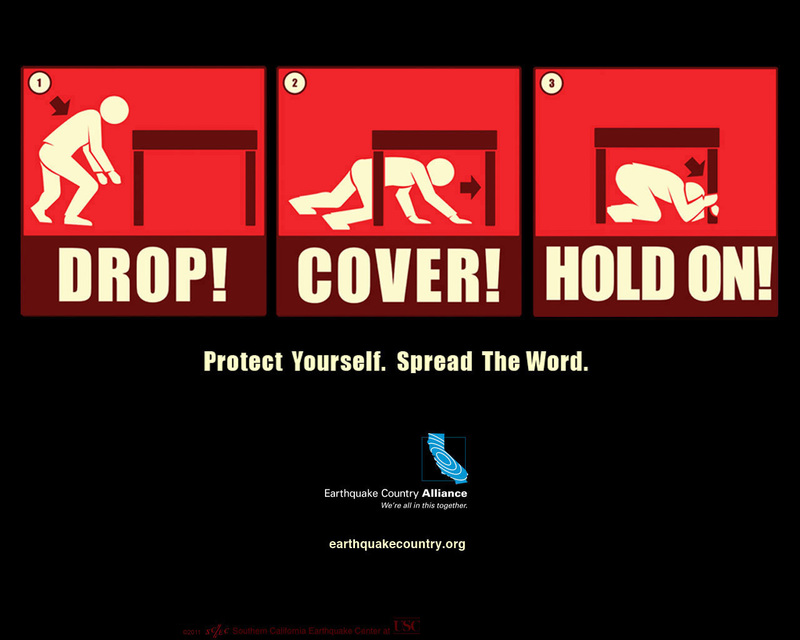 DROP to your Hands and Knees – stay down, stay mobile before you get knocked to the ground by the shaking. Take COVER Under a Steady Table – it would prevent falling debris from injuring you. HOLD on to your Shelter – it’s useless if it flies away. Cover your Head and Neck – if you can’t find shelter, drop to the ground and protect your head and neck the best you can by covering them up with your hands. Avoid Dangerous Items – glass, knives, windows, chandeliers, bookshelves, those could shatter or fall and cause serious injury. Avoid Exterior Walls – if they collapse, you don’t want to go flying outside. Avoid Door Frames – unless it’s a solid load bearing door frame, it won’t offer any protection. Avoid Elevators – it might be the second last box you’re stepping into. The ONLY exception to the “Drop, Cover and Hold On” rule is if you are in a country with unengineered construction, and if you are on the ground floor of an unreinforced mud-brick (adobe) building, with a heavy ceiling. Head to an Open Area – find a place where things will not fall on you. Stay Clear of Buildings – this also includes bridges and utility poles. Really, just find as large an open field as you can. Very rarely will you be killed by being swallowed by the earth. You are more likely to be killed by something crushing you from above. Beware of Power Cables – these could still be charged and electrocute you. Beware of Landslides – if you’re in the mountains, a landslide or avalanche could be your worse enemy. Check out step 5 of the Earthquake Country site. It provides some great trips for different scenarios you might encounter when an earthquake strikes. Avoid Lighting a Match – lighting one will burn away precious oxygen. You also never know if there’s a gas leak nearby that could roast you. Avoid Kicking Around – you will stir up a huge dust cloud, increasing the chance of inhaling dangerous levels of dust. Tap a Pipe, Box or Wall – make sure you tap something that causes a pretty loud noise. If possible use a solid object like a stone to tap. DON’T PANIC – it will prevent you from thinking clearly, in addition to burning up precious and limited oxygen resources. Please share this with your friends to ensure they stay safe too when the earth starts rocking!